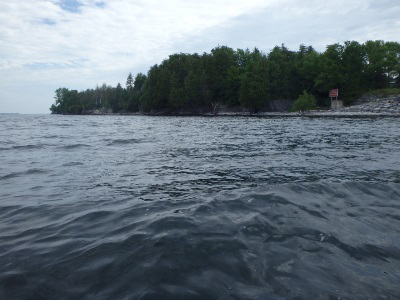 EcoLogic completed an aquatic habitat assessment to evaluate the potential environmental impacts of replacing a transmission line from Plattsburg, New York, to Vermont across Lake Champlain. Included in this assessment was evaluation of the sediment to identify the depth to which aquatic organisms inhabit the sediment. The aquatic habitat within the littoral zone of Lake Champlain (in both New York and Vermont) along the proposed transmission line corridor was investigated on either side of the proposed transmission line location and from shore out to just beyond the extent of vegetative growth. The features of the habitat with respect to substrate type, the presence and type of vegetation, other cover types, and bottom slope were documented via field notes and photographs. The type, general abundance, and aerial extent of macrophytes were documented visually and through the use of rake tosses to sample submergent vegetation. A portable depth finder was used to document bottom coverage of macrophytes and gather information on water depth and bottom slope. Observations of fish and wildlife use of the littoral zone and adjacent areas were recorded. Emphasis was placed on evaluating the habitat with regard to its potential to support rare, threatened, and endangered species, but we also evaluated habitat on its ability to support other aquatic species, fish spawning, and other critical life history stages of aquatic organisms. In addition to the field assessment of littoral zone habitat, we contacted regional, state, and federal agencies to compile existing information on fisheries and other aquatic biota known to occur in the area.